Facial fractures and brain injuries. Labelled artworks of fractures to the facial bones of the skull (left) and two types of brain injuries (right). The facial fractures, seen in anterior (frontal) view, are to the bones of the orbits of the eye sockets. 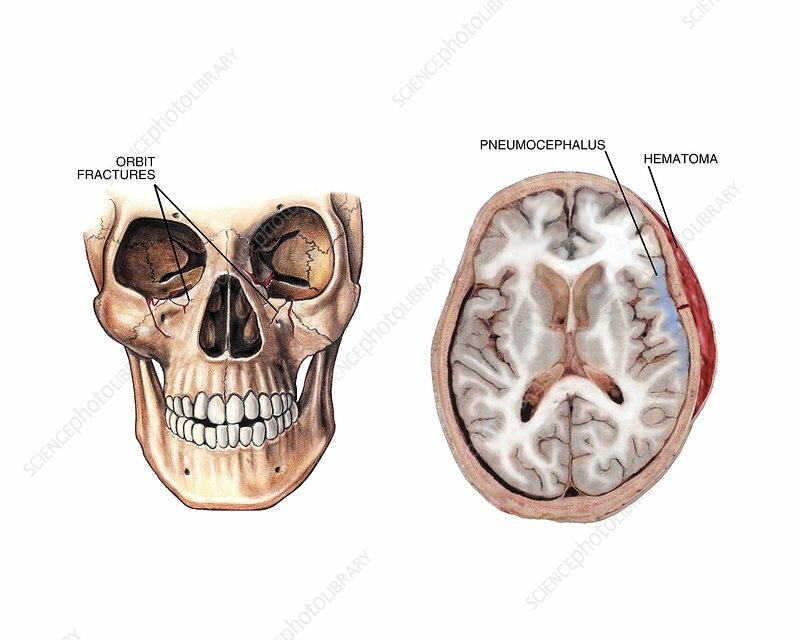 The brain injuries are a haematoma (red) and a pneumocephalus (blue), seen in an axial (cross-section) view. A haematoma is a build-up of blood, in this case between the skull and the membrane enclosing the skull. A pneumocephalus is a build-up of air or gas inside the skull. The fracture that led to these conditions is also seen. The fractures and brain injuries would have been caused by blunt force trauma.